Is your loved one eating regularly and at a proper schedule? Three meals a day doesn’t justify the meal schedule; it has to be three nutritious meals a day. 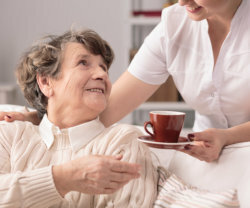 If your elderly loved one is living alone in their home, you may want to consider the services of a caregiver who can keep them company while also ensuring that the senior is able to take in the proper number of meals a day. The caregiver will take care of meal preparation and planning, as well as perform light housekeeping tasks, such as laundry and simple cleaning. Being a dedicated Home Health Care Agency in New Jersey, ExPO Signature Home Care also considers the senior’s diet restrictions and will incorporate this in the meal preparation and planning part of the care plan. For assistance, please don’t think twice about calling us at 732-851-4126.